I have often been guilty of using the phrase, “There’s no such thing as a happy non-performer” when discussing the idea that basic human nature is to be disappointed when performing poorly. In all honesty, it was, at times, my way of justifying (to myself and others) letting an employee go or reprimanding for poor performance. In addition to the performance component, I was telling myself that the employee couldn’t have been happy because he was an underperformer—my way of justifying the psychological component. Allow me to explain. Engagement is not simply a state of being—a psychological condition. Happiness, on the other hand, is just that—a feeling. Engagement requires action. It’s both psychological and behavioral. Think of it this way: psychological = “feel,” while behavioral = “do.” Engagement requires that I both feel and do. I can’t simply feel engaged; that’s only part of the equation. This psychological state is merely a feeling until I act upon it. That’s engagement. Engagement requires that I both feel and do—the psychological and the behavioral. Happy employees, or, for that matter, “satisfied” employees do little good for an organization. That’s why so many of us have hang-ups about whether employee satisfaction actually translates to the bottom line. The truth? It doesn’t! Don’t waste your money. It’s great to have happy and satisfied employees (and we have an important moral responsibility there), but that doesn’t keep the widget line running—at least not at optimal capacity. It’s only when what the employee feels is translated into action that the bottom line gets a boost. Organizations today waste an absurd amount of money on employee satisfaction, as well as keeping employees happy. It’s a noble effort, and one that absolutely needs to continue, but still doesn’t address the “do” component. Did those new coffee machines really increase productivity, or just make employees happy until they realize they don’t have the Smoothie Man come in every Friday, like the company down the road? 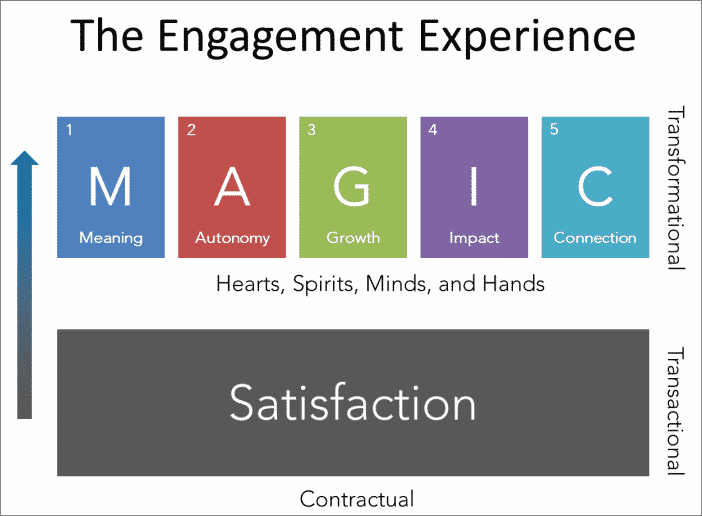 Satisfaction is not engagement. Satisfaction and happiness are the “price of admission.” It lets us play the game, but it’s not what results in the win. Let’s don’t confuse the two. So, happy non-performers? Sure, it’s possible. Engaged non-performers? The very definition of engagement tells us this isn’t possible.